The concept of a Prewrath rapture is one of several premillennial views on the end-times events among some evangelical Christians, and states that Christians will be raptured at the end of a time called the Great Tribulation (which begins at the midpoint of the seventieth week of Daniel), and before the Day of the Lord. (God's wrath). The prewrath position emphasizes the biblical distinction between Satan's wrath in the Great Tribulation (which Christians have been promised) and the wrath of God (which Christians have been promised deliverance/salvation from). According to the Prewrath perspective, the great tribulation begins 3.5 years after the Antichrist "makes a covenant with the many" (Daniel 9:27), in the middle of "Daniel's 70th week." The 70th week is a reference to Daniel 9:24, where each day of the week corresponds to a year (for a total of seven years). After the first 3.5 years, the Antichrist will make himself known with the abomination that causes desolation, and he will reign for 3.5 years (42 months or 1260 days). The latter half of the 3.5 years is characterized by the Antichrist deceiving the world and persecuting the church. God's wrath against the ungodly will follow for the remainder of the seven years in what is known as the Day of the Lord. This view like pretribulationism, midtribulationism, and posttribulationism falls under the larger umbrella of premillennialism was formally named and publicized by Marvin Rosenthal in his book The Pre-Wrath Rapture of the Church, published by Thomas Nelson in 1990, at the prompting of his friend Robert Van Kampen, who went on to write The Sign and The Rapture Question Answered: Plain & Simple. 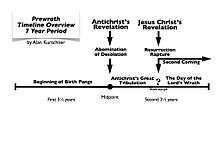 Much of the Prewrath view is based on a linear, chronological interpretation of Jesus’ account of the end times in the Olivet Discourse. In contrast to the traditional Pre-Tribulation view, for example, the moon turning blood red only occurs once according to the Prewrath perspective. Events subsequent to the rapture are based on face-value interpretations of the books of Revelation and Daniel. The "beginning of birth pains" start with wars, famines and earthquakes around the world (Matthew 24:19). This duration is thought to cover the first 3.5 years of Daniel's 70th week, which starts when the Antichrist confirms or strengthens a seven year "covenant with the many" (Daniel 9:24). The Antichrist starts his reign with the “abomination of desolation” (Matthew 24:15) at the midpoint of the 70th week, putting an end to sacrifice and offering (Daniel 9:27). His reign, along with the false prophet (Revelation 13:11), lasts for 3.5 years. The Antichrist's rule begins the great tribulation, a worldwide distress unequaled to any across history (Matthew 24:21). At this time the believers of God face persecution. During the latter half of the 3.5 years and prior to Jesus' return, the sun will be darkened, the moon will not give its light, stars will fall from the sky (Joel 2:10, Matthew 24:29). In Revelation 6:12, this coincides with the opening of the sixth seal, when the sun turns black and the moon turns blood red. God's wrath falls on the remaining unbelievers, called the "day of the Lord" (Joel 2:11). Since the Second Coming and the rapture of the Church occur immediately before the Day of the Lord, they occur before God’s wrath — hence, the “Prewrath rapture” of the Church. The 7th seal encompasses the wrath of the seven trumpets (Revelation 8:2); the seventh trumpet may represent the seven bowls of wrath, which complete the mystery of God (Revelation 11:15). Since the Antichrist’s reign lasts for 42 months (or 3.5 years) according to Revelation 13:5, the Antichrist’s rule ceases at the end of the 70th week. At the battle of Armageddon, the Antichrist and the false prophet are defeated and cast into the lake of fire. Since the time of the Antichrist is 1290 days according to Daniel 12:11 (30 days longer than his 42-month reign), his end is then placed 30 days after Daniel’s 70th week. 45 days after the destruction of the Antichrist, Christ’s millennial reign is established. This is based on Daniel 12:11, which states, “Blessed is he who waits, and comes to the one thousand three hundred and thirty-five days.” The 45 days is derived from taking 1335 and subtracting 1260 days (42 months of Antichrist's reign) and 30 days (the end of the Antichrist), or 1335-(1260+30)=45. A side-by-side comparison of the wording of the sixth seal (Revelation 6:12-13) and the signs in Matthew 24:29 announcing the Second Coming of Jesus and the rapture of the Church indicate that they are the same event. Immediately after the sixth seal is opened in Revelation 6:17, the people of the earth cry out, "hide us from the face of the Lamb!” (the Lamb referring to Jesus Christ), indicating that they are viewing Jesus in the clouds. Since all of the people on earth (every slave and every free man) are crying out of the wrath of God, this implies that all those on earth are unbelievers, and that the believers have already been raptured. Therefore, the rapture in Matthew 24:29-31 occurs after the sixth seal of Revelation, but before the seventh seal of God's wrath. The church is described to be in heaven as the great multitude (Revelation 7:1 ff. ), which has “come out of the Great Tribulation" (Revelation 7:9-11). Throughout the Old Testament, the Day of the Lord is the term used for the time of God's final judgment and wrath upon earth. According to Joel 2:31, "the sun will turn dark and the moon into blood before the great and terrible day of the Lord." This combination of sun turning dark and moon into blood is always used to symbolize the same event: the cosmic signs in heaven before the arrival of the Messiah. This places the Day of the Lord immediately after the arrival of Jesus Christ to rapture the Church (Joel 2:31, Revelation 6:12-13, Matthew 24:29). In 1 Thessalonians, Paul puts the Thessalonians' minds at ease that, while the members of this church were experiencing severe testing and tribulation, the Day of the Lord had not come upon them and they had not missed the Lord’s return. Paul writes that those who are alive at the coming of the Lord (1 Thessalonians 4:15) will be caught up in the sky with Him at the rapture (1 Thessalonian. 4:16-17). Then in Chapter 5, Paul writes that, "but of the times and the seasons, brethren, you have no need that I write to you, for the Day of the Lord comes as a thief in the night" (1 Thessalonians 5:2); but you brothers are not in darkness, so that this day should surprise you like a thief (1 Thessalonians 5:4). According to Prewrath, this passage clearly indicates that the coming of the Lord and the Day of the Lord are part and parcel of the same event, the coming of the Lord. First, Jesus arrives in the sky at His Second Coming, at which time He raptures all Christian believers, then His judgment during the Day of the Lord falls upon those who have disbelieved and rejected His lordship. Prewrath is also distinguished from other premillennial rapture positions as to when, in relation to Daniel’s 70th Week, the Second Coming and rapture take place. Pretrib places the rapture before the 70th Week. Midtrib places it at middle of the 70th Week. Posttrib places it at the end of the 70th Week. Prewrath places it at an unspecified time after the midpoint of the 70th Week, but before the end. This is justified, according to Prewrath, by the fact that Jesus places His return (Matthew 24:30-31) after the abomination of desolation (Matthew 24:15), which occurs at the midpoint of the 70th Week (cf. Daniel 9:27, Daniel 11:31). Thus, if the Second Coming and rapture occur after the sixth seal, this places this event after the midpoint but before the end (seventh trumpet). However, such differences on how specific events occur within the 70th week still fall under the framework of the Prewrath timeline. Dispensationalism - which posits a "parenthesis" between weeks 69 and 70 in the historic fulfillment. Kurschner, Alan. Prewrath: A Very Short Introduction to the Great Tribulation, Rapture, and Day of the Lord. Pompton Lakes, NJ: Eschatos Publishing, 2014. ISBN 978-0-9853633-2-1. Van Kampen, Robert. The Rapture Question Answered: Plain and Simple. Grand Rapids, Michigan: Revell, 1997. ISBN 0-8007-5631-2. Nigro, H. L. Before God's Wrath: The Bible's Answer to the Timing of the Rapture, Revised and Expanded Edition. Milesburg, Pennsylvania: Strong Tower Publishing, 2004. ISBN 0-9704330-7-7. Bussard, Dave. Who Will Be Left Behind and When?. Lancaster, Pennsylvania: Strong Tower Publishing, 2002. ISBN 0-9704330-2-6.
Cooper, Charles. God's Elect and the Great Tribulation: An Interpretation of Matthew 24:1-31 and Daniel 9. Milesburg, Pennsylvania: Strong Tower Publishing, 2008. ISBN 0-9815276-2-0. The first scholarly defense of the prewrath position. Fultz, Cameron. Prophecy's Architecture: How to Build an End-Times Doctrine. Milesburg, Pennsylvania: Strong Tower Publishing, 2005. ISBN 0-9704330-6-9. Rosenthal, Marvin, "The Pre-Wrath Rapture of the Church." Nashville: Thomas Nelson, 1990. ISBN 0-8407-3160-4.